Roger Waters has opened up about the past, present, and future in a new interview with BBC HARDtalk, which will air tomorrow in the US during BBC World News. As he draws near the end of his three-year long Wall tour, Waters said his next venture will come in the form of a new record. He explained, “You know I’ve had a few breakthroughs recently which I won’t talk about, but I am going to make another record. I’ve had a very very strong idea, and I shall pursue it, and I will make at least one more record and I am really looking forward to getting my teeth stuck into it.” Water’s last proper solo album was 1992′s Amused to Death, though he released the three-act operaÇa Ira in 2005. But perhaps the most noteworthy part of Waters’ interview stemmed from comments regarding his departure from Pink Floyd in 1985, and the subsequent legal dispute between he and his former bandmates. Specifically, Waters said he was “wrong” in his attempts to stop David Glmour, Nick Mason, and Richard Wright from continuing on under the Pink Floyd banner. At the time of his departure, Waters considered Pink Floyd “a spent force,” and was displeased over the continued use of the band’s name. He filed several injunctions against Gilmour and Mason to no avail, even threatening to sue concert promoters who advertised the band as Pink Floyd. 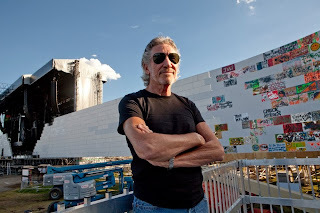 Ultimately, he and Gilmour settled, with Waters agreeing to relinquish the name Pink Floyd in exchange for trademark over The Wall and his famed inflatable pig.